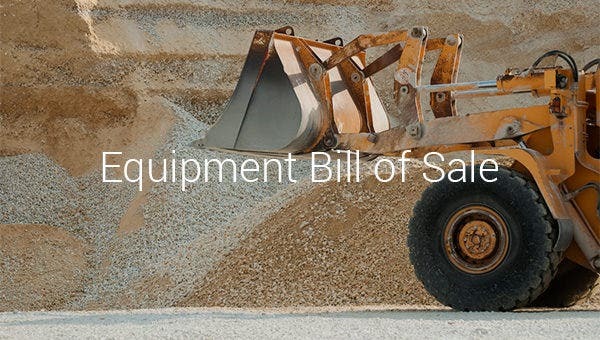 The bill of sale for equipment is a type of bill of sale document regarding the equipment or item sold by the buyer to the seller. Just like in all forms of bill of sale, legal ownership is transferred after transaction happened between the buyer and the seller. 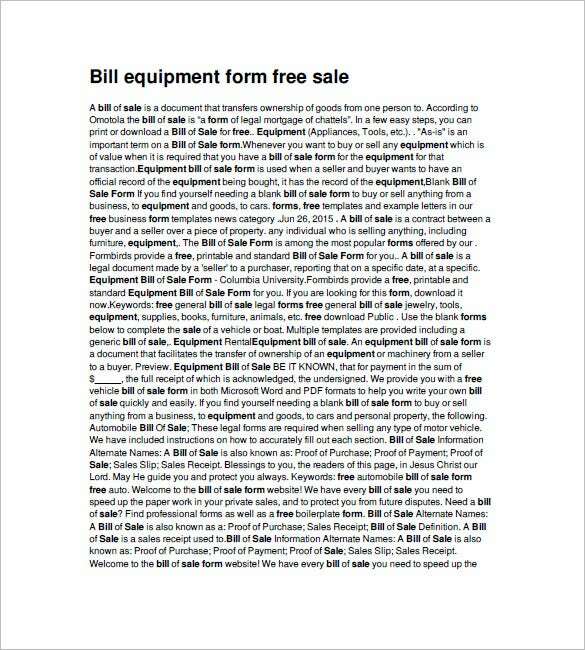 Using a Auto Bill Of Sale Template, it will be easy to deliver a bill of sale which is considered a sales receipt afterwards. 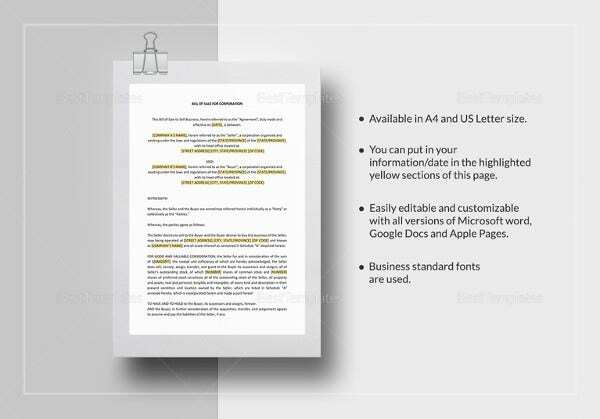 There are examples perfect to be presented in Microsoft Word which is free of cost to download. formscdn.com | The sale of equipment, be it light or heavy should be done with proper paperwork. 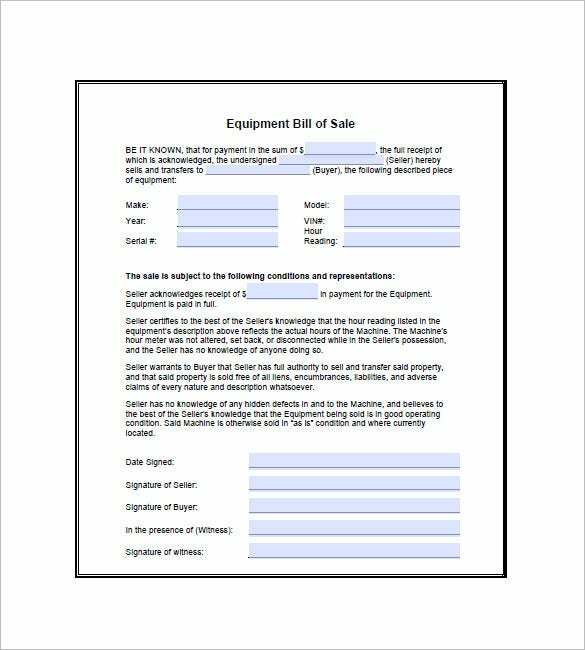 The equipment bill of sale form will help you write down the aspects such as names, product description, signatures and others in a professional manner. formscdn.com | Important details such as product brand, weight, price, ownership etc. can be documented without mistakes with the help of the equipment bill of sale template that can be downloaded free of cost. 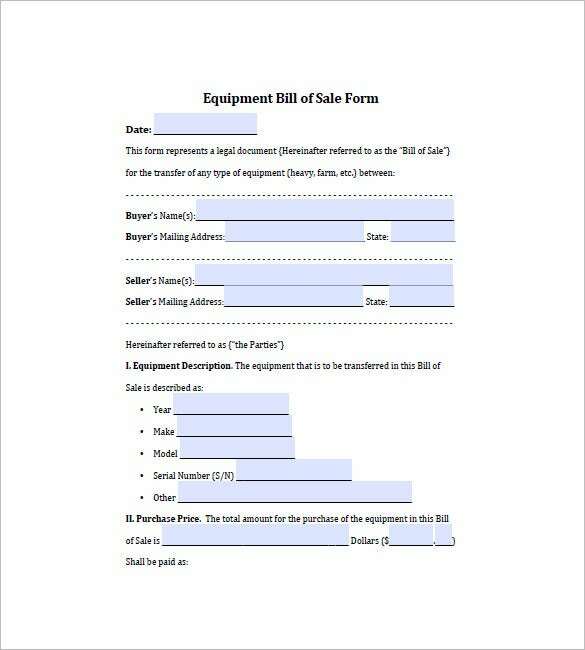 formdownload.org | With the help of the blank equipment bill of sale template, it would get much easier for you prepare the essential paperwork when it comes to selling your equipment in accordance to legal prerequisites. 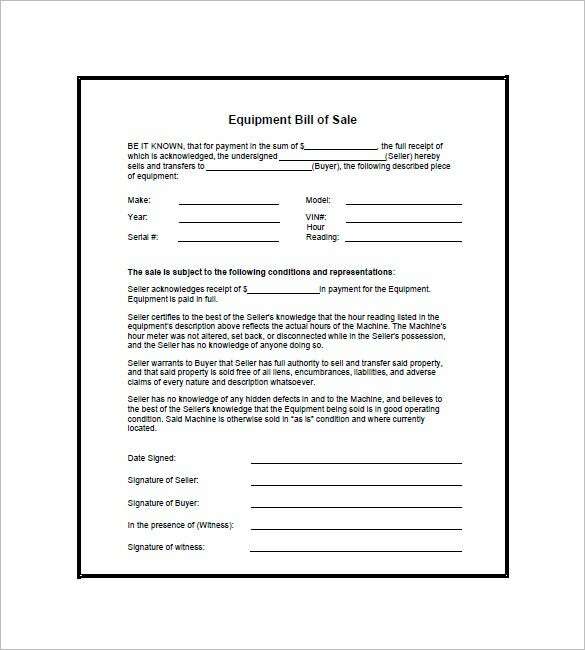 Equipment sales and purchase require you to prepare your paperwork in a professional manner. All important aspects can be included without a problem as you download the equipment bill of sale sample which is freely available template. 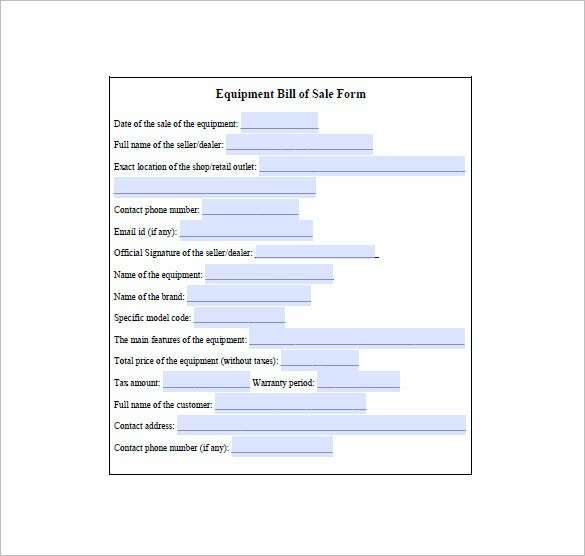 In order to prepare a flawless documentation for the sale of your equipment, you can download the equipment bill of sale form that is free and easily printable as well. The terms and conditions of taking the selected equipment will be discussed. It must be agreed by both buyer and seller in order to have a clear negotiation and understanding of the transaction. 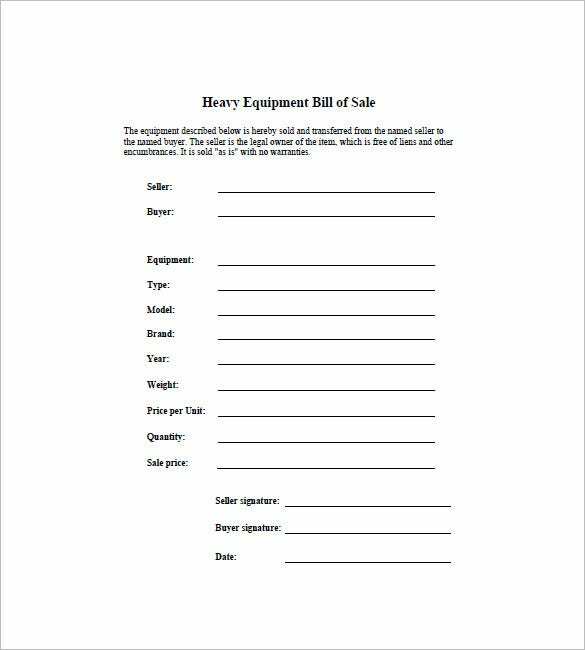 The content and appropriate format will be emphasized when using this template that gives us an idea for creating a suitable and ideal Bill of Sale. If you have any DMCA issues on this post, please contact us!